Finding a fancy gift for every person on your holiday shopping list can be daunting! 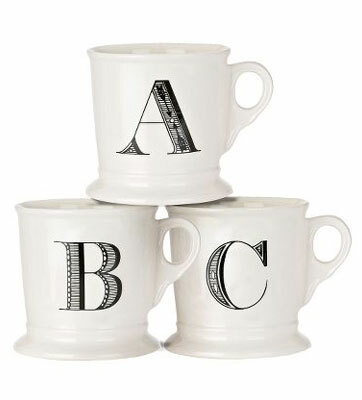 One of my favorite gift ideas this season are monogrammed mugs from Anthropologie. I received two of these as a wedding gift and use them every day! I also gave one of these as a gift last year to one of my fancy friends who really enjoyed it. They make me smile. At just $6 a pop, you may be able to afford to throw in some tea or coffee samples as well. Consider buying the coffee from a local shop that roasts the coffee beans in house. Try White Rock Coffee in Highland Park or Peace Coffee for a delicious brew! Send your fancy gift ideas to livethefancylife@gmail.com. And don’t forget, cans for comments is running now through Dec. 8! Leave a comment to help someone in need. Live the fancy life today! 6 Responses to "fancy gift idea—monogrammed mugs"
I just bought some for only $10 – they are cute and very very warm! I bought them at a green craft fair at Midtown Global Market. Regardless, these mugs are adorable, and would be a great gift! I am sipping coffee from mine as I write!!! It is by FAR my favorite mug and there is an up front spot in my cupboard reserved JUST FOR THIS MUG!!! And yes, Fancy Jes gave it to me! Yay Katie! Glad you remembered it was me! Love Anthropologie. In the most recent catalog, they have included some wonderful gift possibilities. My favorite- the fabric wrapped Penguin Classics like “Sense and Sensibility” for $20. I would collect each of them just for the beautiful fabric covers! I like this gift idea and am thinking it would be a great gift for some girlfriends that love coffee. Thanks!